This is the second part of a two-part series. Part one is available here. 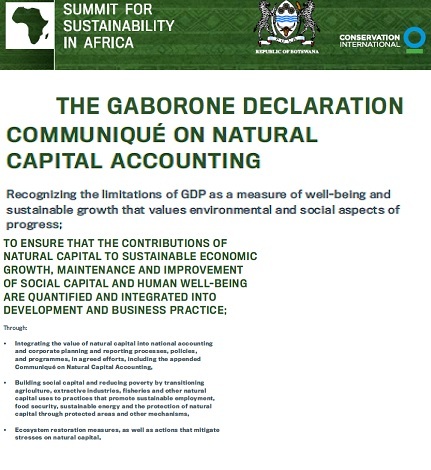 Even though the World Bank has traditionally lined up in favour of corporate looting of Africa via its “export-led growth” strategies and dogmatic philosophy of economic deregulation, several Bank staff in the “Wealth Accounting and the Valuation of Ecosystem Services” group played a major role in the Gaborone Declaration. 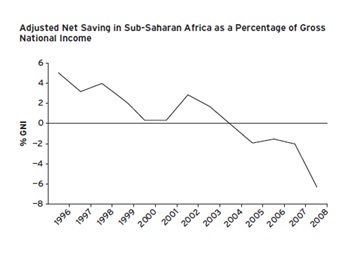 Their view of “adjusted net savings” as an alternative to GDP is instructive. There are four steps to understanding changes in wealth. 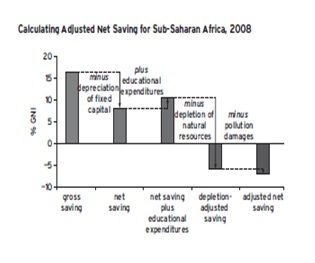 Total savings should be discounted first for wear and tear on fixed capital (-); second for “human capital” investment in education (+); third for natural resource depletion (-); and fourth for pollution (-). For Africa as a whole, these four corrections pushed the rate at which wealth accumulated in 2008 from 17% of national income, down to -7%, mostly because of resource depletion, according to the Bank’s The Changing Wealth of Nations. Source: World Bank, The Changing Wealth of Nations, p. 38. Source: World Bank, The Changing Wealth of Nations, p. 19. To take one example, in Zambia, the savings rate of 26% should be discounted for wear and tear on machines worth 11% of national income; education spending adds 2%; depletion of copper subtracts 20%; and pollution subtracts another 1%. In a given year, that leaves a typical Zambian 3% poorer on December 31 than when she woke up on the prior January 1. To take another example, in relatively more industrialised South Africa, the depletion of minerals costs the country 9% of its gross national income and as a result, the net decline in the average South Africans wealth after a typical year is $245. Why do these depressing counting exercises? One reason is to make the case for “ecological debt” in courts of law. For example, of Nigeria’s recent $11.5 billion claim against Shell for a 2011 oil spill, more than half is meant to compensate fisherfolk. The liability owed to silicosis-afflicted mineworker victims of Anglo American and other gold mining houses may reach $900 million. Gencor and Cape PLC had to pay £45.5 million a decade ago to settle South African asbestos lawsuits after they lost their last appeal in the UK House of Lords. Similar arguments should be made against the MNCs most responsible for what the UN calls “loss and damage” due to climate change. Or against companies like Lonmin that remove Africa’s natural resources, corrupt its governments, despoil the landscape, wreck workers’ health, establish untenable social relations such as the migrant labour system, and return a pittance to South Africa. Ideally, over time, this strategy would develop as “fine-and-ban,” so that as a corporation makes an egregious error, it is fined punitively for the damage done, and then sent packing. Fatally damaging processes such as asbestos mining should then be consigned to the dustbin of history; indeed in that case, that lawsuit bankrupted Cape PLC. To be sure, there is a danger that natural capital accounting will become, instead, a “fee” for pollution; the damage continues, but with an ongoing payment. The strategy known as “Payment for Ecosystem Services,” promoted by the more neoliberal of “green economy” advocates, represents this sort of parallel danger: commodifying the environment. An example of an unworkable “neoliberalised nature” strategy to address climate change is carbon trading, yet South African Treasury bureaucrats last month endorsed a policy move in that direction—which climate justice activists are opposing. To that end, there is a much stronger ecological, political and moral case yet to be made based on Africa’s declining natural capital accounts. Thanks to various kinds of Resource Curses, much of Africa is like a household whose ne’er-do-well nephew finds the key to the cabinet that holds the family silver (natural capital), at which point he loots the valuables, sells them at a fraction of their worth to a sleazy buyer, buys booze, drinks away the proceeds, and then pisses all over the floor back home. By counting the natural capital outflow and related illicit financial flows, at least the family is in a position to learn about, and hopefully halt, the looting—even if that means putting the nephew into a treatment centre. 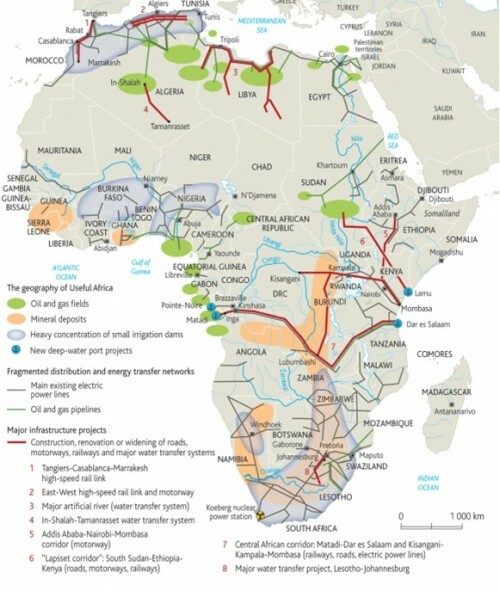 The equivalent act for a responsible society in Africa, while these Resource Curses persist, is to leave the minerals and petroleum in the soil—at least until the continent’s wealth is no longer the cause of its systematic poverty.